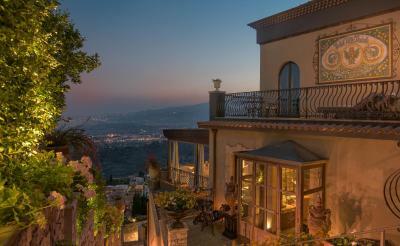 Lock in a great price for Hotel Villa Ducale – rated 9.4 by recent guests! My husband and I fell in love with the hotel grounds and the view was absolutely breathtaking. 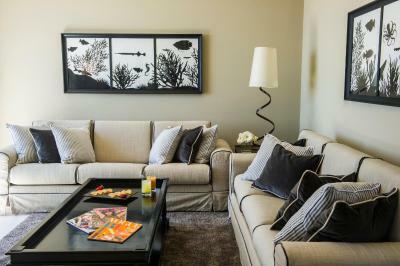 The staff was accommodating and it was such a quiet retreat to come home to from the city center. 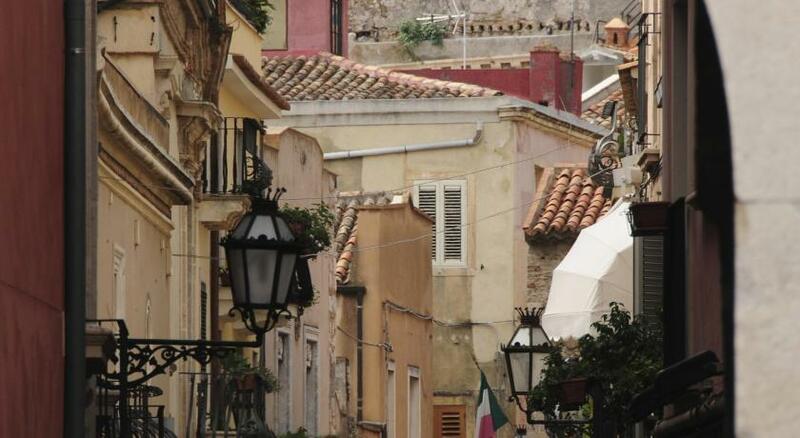 Taormina is such a spectacular town to visit, which is why my husband and I will return next year. The staff was warm and welcoming. The breakfast was wonderful. The view was spectacular. Lovely views, great room (we stayed in the Annex apartment), incredible breakfast buffet. Nice appetizer plate with cocktails. Location is mixed. Great view because you're high, but a trek into town. 15 mins on the stairs in good weather is no problem, if if it rains (like it did for us), then you're toast. The views are amazing, especially in the dining area! The staff was helpful when we asked about going to a beach club, they made the calls and got us the transfer. It is a beautiful hotel to stay at. The staff is friendly, the design of the room is ecsquisite! The view is wow and definitely will go back to stay at villa ducale! Amazing and very helpful staff. The service was incredible, the snacks were delicious. Incredible views. Comfortable bed. Large, updated room. Nice shower. Large balcony. Great breakfast food selection. Appetizers served during happy hour. Free shuttle service to/from town. Everything from the quality of the service to the food to the comfort was excellent. It is an elegant hotel for travellers who appreciate the very best. Hotel Villa Ducale This rating is a reflection of how the property compares to the industry standard when it comes to price, facilities and services available. It's based on a self-evaluation by the property. Use this rating to help choose your stay! 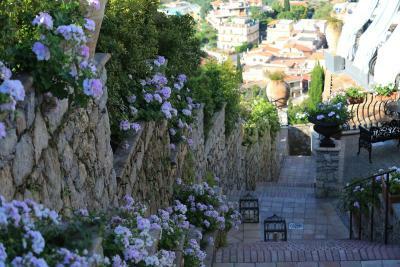 One of our best sellers in Taormina! 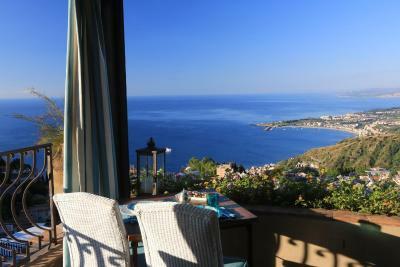 Villa Ducale is a small, luxurious boutique hotel with outstanding views of the sea, Mount Etna and the Strait of Messina. It features free WiFi in public areas, an outdoor hot tub, and a sun terrace with loungers. The strategic location of Hotel Villa Ducale combines the tranquility of a panoramic spot and the proximity to the town center, a 25-minute walk away. 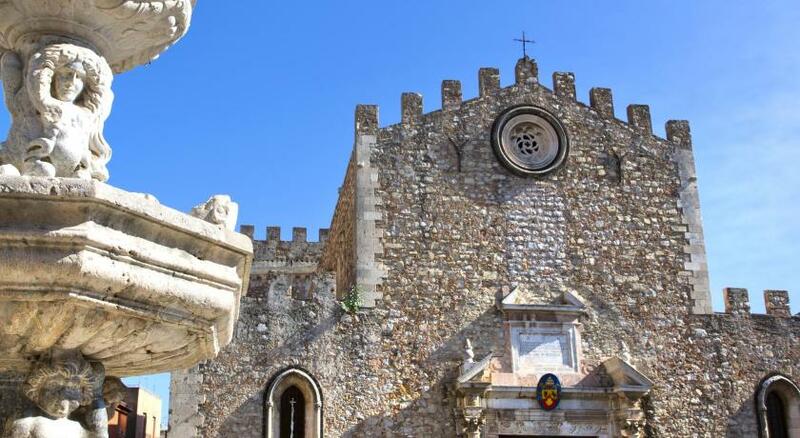 The hotel offers a free shuttle service to the center of Taormina, and an airport shuttle is available on request. 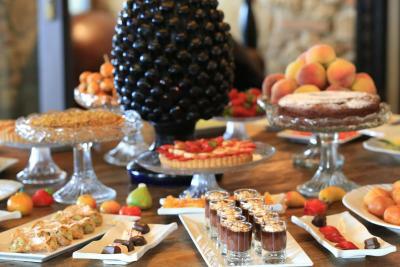 Villa Ducale is renowned for its rich breakfast buffet with homemade Sicilian specialties, served on the panoramic terrace. Restaurant service is available throughout the day, and the hotel features a popular cocktail buffet every evening. When would you like to stay at Hotel Villa Ducale? This smaller air-conditioned room offers an LCD TV with Sky channels, free WiFi and a mini-bar. 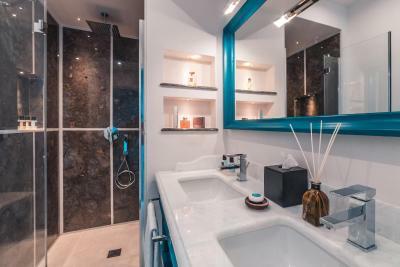 The private bathroom includes a hairdryer and complimentary toiletries. Featuring a furnished balcony with sea views, this air-conditioned room offers an LCD TV with Sky channels, free WiFi and a mini-bar. The private bathroom includes a hairdryer and complimentary toiletries. With a furnished sea-view terrace and free WiFi, this luxurious air-conditioned suite offers a double or twin bedroom, plus a small living area with sofa and LCD TV with Sky channels. The bathroom features a hairdryer and complimentary toiletries. 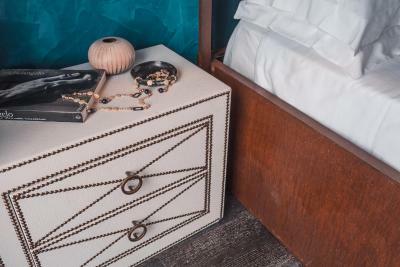 Featuring a furnished balcony with sea views, this air-conditioned suite offers a separate living room, an LCD TV with Sky channels, free WiFi and a mini-bar. 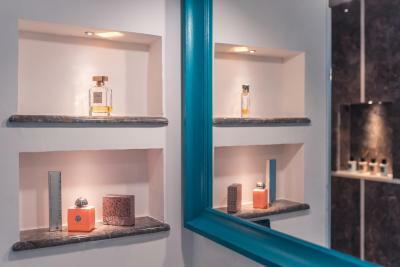 The large private bathroom includes a rain shower, hairdryer and luxury toiletries. Soft bathrobes and slippers are also provided. Featuring a furnished terrace overlooking Naxos Bay and Mount Etna, this spacious air-conditioned room includes a separate living area, an LCD TV with SKY channels and free WiFi. The large bathroom comes with soft bathrobes plus slippers, luxury toiletries, and a hairdryer. Featuring a terrace with sun loungers and overlooking the sea and Mount Etna, this air-conditioned room includes an LCD TV with SKY channels, free WiFi, and a mini-bar. The bathroom has soft bathrobes, slippers, a hairdryer, and luxury toiletries. 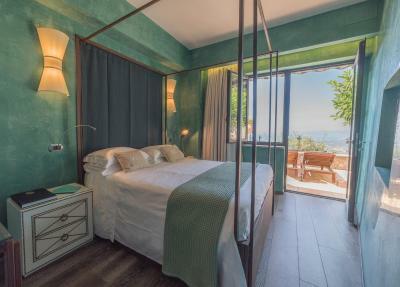 Featuring sloping ceilings and a terrace with Mount Etna and sea views, this suite includes designer furnishings, free WiFi, and an LCD TV with SKY channels. 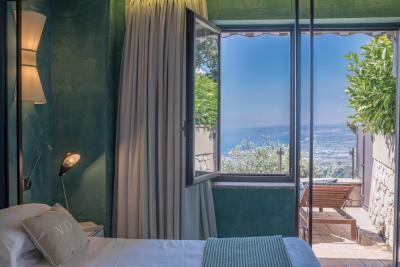 The bathroom comes with a shower and a stylish bath with sea and Mount Etna views. Some bathrooms also have a rain shower. 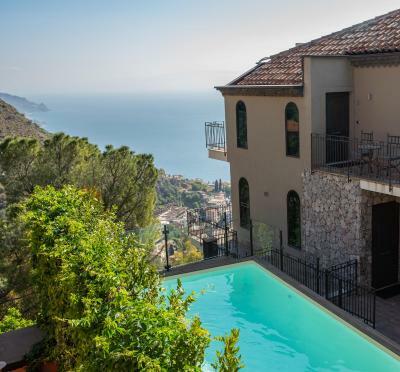 Villa Ducale was a private villa converted into a small luxury boutique hotel with astonishing views, an ideal place for romantic getaways, far from the bustling town center, but close enough to walk there. 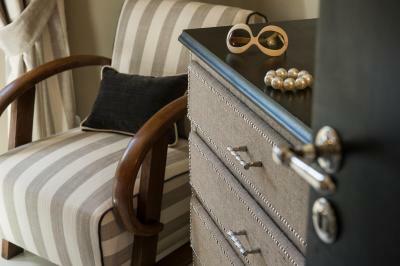 House Rules Hotel Villa Ducale takes special requests – add in the next step! One additional child or adult is charged EUR 70 per person per night in an extra bed. Hotel Villa Ducale accepts these cards and reserves the right to temporarily hold an amount prior to arrival. Please note that the entire amount of the original booked stay will be charged in the event of early departure. Please note only small pets are allowed on request at the property. Please inform Hotel Villa Ducale of your expected arrival time in advance. You can use the Special Requests box when booking, or contact the property directly using the contact details in your confirmation. Breakfast with an incredible view and the panoramic view from our room. The little extras In the room such as the high quality towels and the towel heater really added to the experience. Better shuttle times to the main town. The food, breakfast, service, room - everything was superb! The room we stayed in (courtyard view) could get noisy from about 7am, so we couldn't really have a lie in if we wanted to (sounded like a ventilation unit coming on outside the room, and staff/guests making their way to and fro the hotel reception. Everything at the hotel was great, the staff were extremely friendly and the breakfast was great! 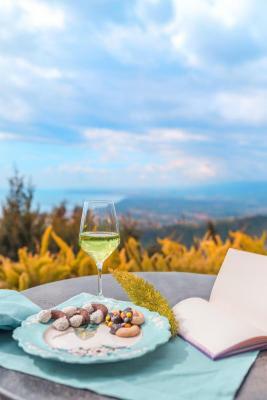 It was a really welcoming at the hotel, the staff where fantastic, helpful and good English speaking, the views was breathless having the Etna on your right and Taormina below you and other some town. 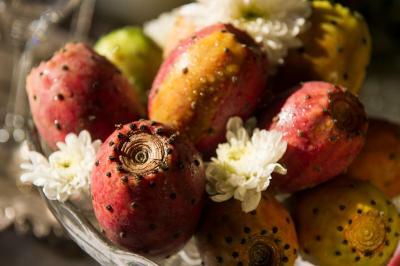 The morning breakfast was very nice presented and healthy....it was nice that they had a shuttle bus to and from to Taormina centre. We definitely recommend this place and I will again visit here in the incoming future. Thank you . Perfect place for romantic getaway, amazing view from balcony, greetings from staff with Prosecco, ideal for making great first impression from meeting Sicily and Taormina. Kindly staff . Nice scenery. the trouble correspondence was wonderful. The view is amazing, staff is super friendly, rooms were outstanding! 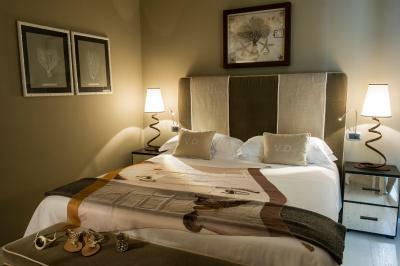 Comfortable accommodation, tastefully decorated. Lovely staff. Nice boutique hotel. Beautiful views.